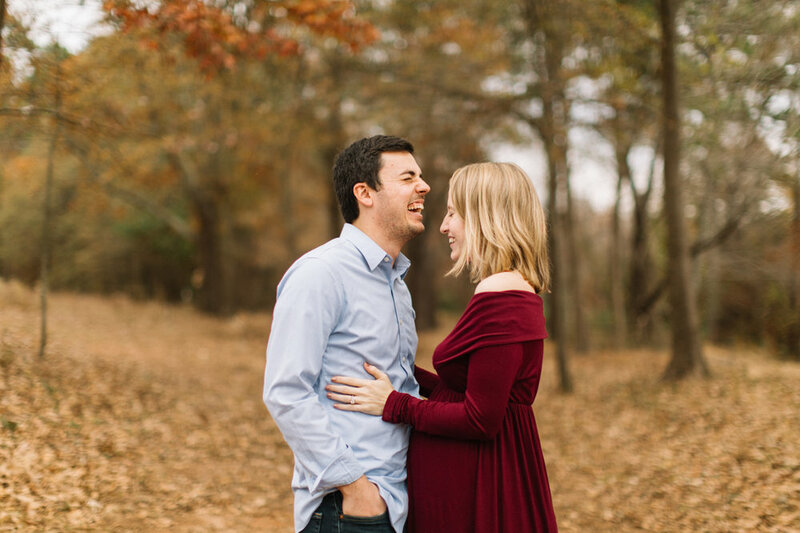 We did a few images on my camera with a friend, but through the busy season of preparing for our unexpected 2013 baby, I didn't even think about doing a maternity session. Not once, until years later, did it cross my mind. I have plenty of bathroom selfies on my cell phone, showing the progression of my belly getting bigger, but I have to be honest with you...I hate them. Those bathroom selfies only show me (and possibly my terrible choice of phone case at the time.) They don't show the excitement my husband and I both shared about our coming baby, they don't show the romance between us that was different then (yea, newsflash, everything changes after a baby, even that), they don't show the deep breaths we were taking together before we jumped in the ocean of parenthood. I thought the selfies were fine at the time, they were showing that my belly was growing, but looking back, my belly wasn't what was important to document. The two of us...making plans bigger than ourselves, dreaming about what name we might call our boy (we didn't choose until we saw him), wondering about our future with hope and fear and all the emotions that come with pregnancy hormones...those are the moments I wish I thought to document. So, expecting mama, this is what I want for you: I want you to forget about all of the Pinterest images you've seen with an open gown blowing in the wind, 38 week baby belly glowing in the sun, all set in a glorious mountain scape. Those are beautiful, but I want more for you. If you are an adoptive parent, waiting for your placement, you still can own a season of maternity; you are connected to your future child in ways only your hearts know and it is just as tangible as a growing womb. If you are single, I want you to know that you are strong and capable and your dreams for your sweet baby are the most beautiful gift in the world. If you have a partner, I want you to know that the story of your family started between the two of you and that the little moments as you think about and plan for your future together is bigger than you could even imagine. And that is where my heart is at in every maternity session. Carrie and Jordan, I wish you so many blessings as you walk together towards parenthood. May these images of your lives during this season of maternity bless you and remind you of the secrets only you know about your hopes, plans, and dreams for your family!